As part of a new agreement between the two space agencies, the European Space Agency will provide the service module for NASA’s Orion spacecraft. Image taken from a video released Jan. 16, 2013. For the first time, NASA is reaching out to a foreign space agency for help building a vehicle to launch astronauts into deep space. NASA has teamed up with the European Space Agency (ESA) on its Orion spacecraft, a new capsule to carry people beyond Earth orbit to the moon, an asteroid, and to Mars. While NASA and its contractor Lockheed Martin will continue building the crew capsule of Orion, the spacecraft's service module will be taken over by Europe. 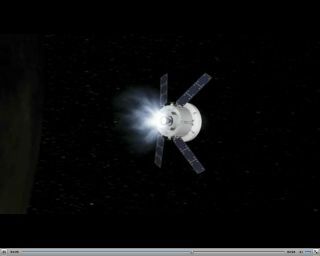 The service module is a vital component that provides the power, thermal and propulsion systems for the Orion capsule. Orion crew and service module with annotations. Image released Jan. 16, 2013. The spacecraft is designed to be launched by a NASA heavy-lift rocket called the Space Launch System, which is also under development now. NASA and ESA already have a long history of cooperation on the International Space Station. The $100 billion orbiting laboratory is a joint project of 15 different countries represented by the space agencies of the United States, Russia, Europe, Canada and Japan. "With space station we've learned the real meaning of cooperation," said William Gerstenmaier, NASA associate administrator for human exploration and operations. "It's actually giving up a piece of the work you're going to do, and actually counting on your partner to deliver." Gerstenmaier admitted that the novel situation will likely prove challenging. "I'm a realist and I know that this won't be easy," he said. "It's not 100-percent comfortable, but I'm never 100-percent comfortable, so it's okay, and we're doing it smartly." One of the chief sources of difficulty will be managing the integration of the two spacecraft elements into one working vehicle. Gerstenmaier said the two space agencies had devoted significant thought to choosing the best meeting points and interfaces between the Orion crew capsule and service module to enable the elements to work together seamlessly. While the partnership is a first for NASA, private U.S. companies such as United Launch Alliance, Orbital Sciences and SpaceX have used international components, such as elements built in Russia, on their rockets, said NASA spokeswoman Brandi Dean. The new agreement means the preliminary design for Orion will change slightly, notable from a vehicle with two protruding solar arrays spaced 180 degrees from each other, to a system of four solar arrays in a cross pattern resembling the X-wing starfighters from the "Star Wars" films. That design mimics the array formation on Europe's unmanned Automated Transfer Vehicle cargo spacecraft, which deliver supplies to the space station. "Orion will look different — the arrays look a lot like an ATV," said Orion program manager Mark Geyer. "I think that's a visual representation of this agreement and the changes that we're making." Europe plans to spend about U.S. $200 million (150 million Euros) to develop the service module for Orion's first test flight in 2017, as well as portions of the second service module for a later flight. The deal does not specify whether any European astronauts will fly on Orion missions, but both partners said that is still a possibility. "This cooperation opens new perspectives for bringing humans beyond low-Earth orbit and certainly this is one of the areas where I will start discussing with Bill [Gerstenmaier] what possibilities there are," Reiter said. "But at the moment we are focusing on the technical work that needs to be done. I think it would be a fantastic opportunity." Gerstenmaier said the new ESA deal is only the first of what's likely to be numerous international partnerships on future deep space exploration. "We're also looking at partners even beyond the [space station partners] to see if there are other contributions that folks might be interested in making," he said. "I truly believe it won't be bilateral. I think you'll see us reaching out to other partners."